The defensive end position in football is the most flexible position on the defensive line. To become a dominant defensive end you must have the agility and quickness of an outside linebacker, while possessing the strength of an interior lineman. Some key duties of a defensive end are to guard against outside runs by the offense and, most importantly, to rush the passer from the edge of the defense. 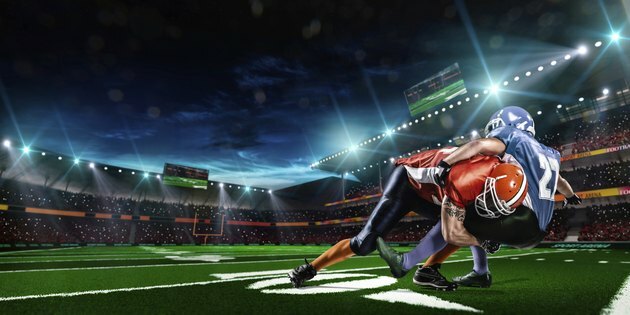 While natural ability plays a key role in being a good defensive end, sound techniques and a relentless passion for high-intensity training will develop an elite defender. Develop a good stance that allows you to stay low and explode off the ball. Every player’s stance has slight differences because of body type, but the most important aspect is that you are comfortable. A basic run stance by a defensive end is a three-point stance. The near hand should be on the ground near the player you are attacking. The off hand should be cocked and ready to shoot at the offensive player. Your feet should be shoulder-width apart with the foot on the side of your ground hand back in a slight stagger. Your backside should be slightly higher than your shoulders, and your first step out will be a power 6-inch step. Practice this stance and charging up the field. Sack the quarterback by developing a pass rush stance. This stance has the same components of a run stance with slight differences. This stance should be used in obvious pass rush situations. Your feet will be spaced more narrowly than when you are in a run stance; it should look more like a track stance. The off hand is no longer cocked; it is straight against your side. Your backside should be higher in the air, forcing your weight forward, which allows you to get up the field better. Your first step is no longer a 6-inch step but a long step designed to close the distance and cover ground between you and the offensive lineman. Practice this stance and charging up the field. Practice and hone skills essential to defensive ends by performing bag drills. Practice the shoot the hands drill, which will focus on hand speed, hand placement and rolling your hips. Have a friend hold a football shield. Drop down to your knees, roll your hips forward and shoot your hands violently toward the shield. Keep your thumbs up and grab the inside part of the bag. Hold that position with your hips rolled forward and your arms locked out for two or three seconds. That will allow you to identify any problems with technique and to develop muscle memory. Perform agility drills during your workouts to improve your quickness and lateral movement. Changing direction, accelerating and decelerating quickly are components of a good defensive end. Some drills that will improve your footwork are the short shuffle, agility ladder drills, dot drill and pro agility drill. Lift weights to build size and strength. You will be going up against offensive tackles who can be bigger than you. Using an Olympic-style weight training program that emphasizes such power lifting exercises as the hang clean, squat, push press and bench, will develop the muscles you need to succeed. In all drills, practices and games, go full speed. Never lead with your head during drills, practice or games. Consult with a doctor before doing any strenuous activity.